Give your mattress a makeover, be it old or new. Made in the USA with local, organic ingredients. Our PureGrow Wool™ and Natural Latex Mattresses, mattress pads & toppers, comforters & pillows are completely chemical-free and beyond organic. They are filled with PureGrow™ wool fleece and covered in 100% Organic Cotton. PureGrow™ Wool, is the premium "Organic" wool we've carried for over 23 years. This wool goes beyond "organic" standards and is 100% American from free-range "happy sheep" ranched in Northern California, Oregon and Washington. They are raised in outstanding natural and healthy conditions under strict organic and PureGrow™ Wool standards. We have completely chemical free organic pillows comforters and plastic-free/vinyl -free waterproof puddle pads made in exactly the same way to complete your bedding the right way. 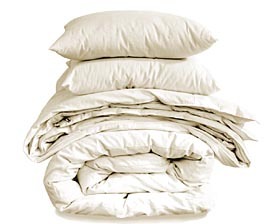 All natural - all comfortable - all pure and all inside organic cotton covers! Accept no imitations - This is the cornerstone of the Earthsake Natural Bedroom bedding line and the shining light behind the Earthsake epiphany. Whether you’re ready to commit to a new mattress or not, every sleeper can benefit from this pillar of the Earthsake Natural Bedroom. You can make an advanced change at an intermediate price with our PureGrowWool filled 1 ½” mattress pad, enjoying the healthful benefits of 100% PureGrowWool with the convenience of this slip-on pad. Create an incredibly comfortable pillowtop mattress out of any mattress with one of our great 100% natural, organic mattress toppers! Available in Twin(39x76), Full(54x76), Queen(60x80), Standard King(78x80) and California King(72x84). Remove any covers or protectors and expose the pad or topper to Sun & Air every 2 months for one hour on each side. It may also be vacuumed carefully. We do not recommend placing pads or toppers in a dryer even with no heat or on air fluff only. While this is useful for pillows it is not recommended for pads or toppers. Please use mother nature's air and sun only for regular refreshment. Stains/odors may be spot cleaned using a solution of 1:3 parts distilled white vinegar and water. Spray the vinegar/water solution on the stain and expose to direct sunlight. Allow to dry. It may require a few applications until the stain fades and/or odor dissipates. You may also use a non-toxic spot cleaner or odor remover as directed. Be sure the product dries completely. Approximately one-third of the height will compact over time. This is considered normal. Outer fabric is organic cotton and some variation in color is normal. Using the natural properties of PureGrow wool our pads and toppers keep you cool in the summer and warm in the winter so you'll sleep soundly in any season...all without bringing unhealthy toxins into your world. It cushions magnificently, is ultra-absorbent and breathable, and its size allows for easy outside airing. 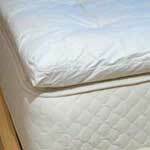 Just fasten the elastic corners to your existing mattress, and relish the pad’s ability to alleviate pressure points as it wicks away body moisture. You can also increase the amount of soft cushioning with one of our "pillowtops" - either our 3" PureGrow Wool filled topper or our 2" Natural Latex & PureGrow wool topper which brings the supportive and custom fitting properties of latex to any bed. All pads and toppers are organic cotton on the outside. 100% natural and chemical-free - ALWAYS! While others may claim to be 100% Natural or Organic, they often do not use PureGrow wool™ and there is a world of difference: Most wool, whether "organic" or not, is put through a harsh chemical cleaning process called "carbonization". PureGrow wool™ is not carbonized. Most people who believe they have an allergy to wool are actually reacting to the process of carbonization. Our PureGrow™ Wool fleece has been tested with even the most sensitive individuals and the only reaction they had was pure comfort and luxurious feel! Go ahead - Experience intense comfort and cushioned bliss. Discover the difference between our PureGrow™ Wool and other so-called natural organic pure wools. You will be amazed!